« You Wouldn’t Treat A Dog the Way You Treat Yourself. 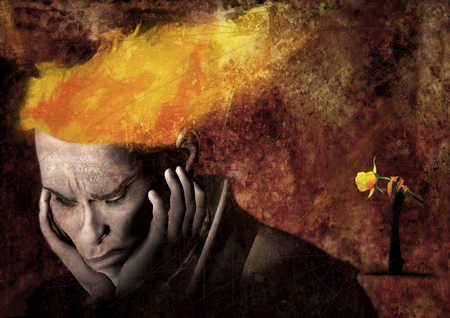 Is Your Mind Inflamed? Soothe It. Today we ask that you commit to reducing stress in your mind and body. While it is possible to take measures to reduce external stress, for many it is not practical to completely rearrange their lives. And even the thought of doing so is so overwhelming that it breeds paralysis. You do not have to upend your whole life. All that is asked is that you reduce stress in your mind and body. You reduce stress in your mind by questioning the truth of your stressful thoughts. You reduce stress in the body through gentle exercise, meditation, and relaxation techniques. If you take steps to reduce stress in your mind and body, it can transform your whole experience of life, without changing external factors. You may still have the commute. You may still have the annoying boss. You may still have the screaming kids. You may still have the lower back that flares up. But you will not experience these things as agonizingly stressful. Your sense of pain and irritation around these factors can be greatly reduced. A stressed-out mind and body is like an inflamed joint. Everything irritates it, everything triggers pain and discomfort. Reducing mind-body stress is like reducing inflammation. Things feel freer and looser, and there is much less pain. As with taking an analgesic for physical inflammation, many people reduce mind inflammation with antidepressants. And that is okay, especially in acute situations where the pain is intolerable. Yoga and tai chi reduce mind/body inflammation. Practices like The Work and the Emotional Freedom Technique are simple, free techniques that you may learn that will naturally reduce mind inflammation. An anxious, stressed-out mind is like an inflamed joint or muscle. Just as an inflamed joint or muscle cannot move properly, an inflamed mind cannot think properly. Please find ways to soothe the inflammation. You do not have to change your whole life to do this. There are techniques and practices that will bring you relief immediately. All that is asked is that you be willing to do them.